Ministry in the northern coastal city of Tela City, Honduras, can be very strenuous, and that’s exactly what Luiz Ortiz and his family are doing. Luiz and his wife, Wendy, and their young son, Jaris, serve together through IECA Cristo Viene. It is here that they have decided to reach their “Judea and Samaria” by starting a Bible study in the La Curva neighborhood, in order to reach out with the gospel of Christ. The harvest work is difficult. The biggest challenge is that many women in the area were previously exposed to a false gospel, and they are now resistant to believing in God’s true Word. However, there is hope. Juana was a local woman who began coming to the Bible study last year, and she trusted Christ as her Savior! 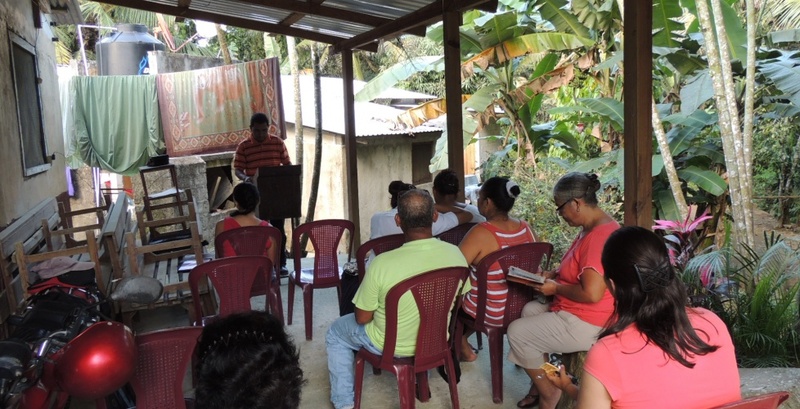 Juana’s husband, Juan, still chooses to reject the gospel. However, Luiz Ortez has been able to share God’s salvation plan with him multiple times while they both worked to put a cement floor in their kitchen in a HOPE Coffee-sponsored project. During this process, Juan has slowly become more open to the gospel, and has even begun to visit church on occasion. Please pray for Juan and others in this Bible study, that they would choose to trust in Christ for their salvation. HOPE Coffee continues to give 100% of its net profits to support servant-evangelism projects in Honduras. It is through these projects that the gospel is being shared. That’s the power of mission-based coffee.